Absolut Groovers is the project born in fall of 2012 by two italian DJs and producers: Igi Biondi and Matteo Esse Dj. 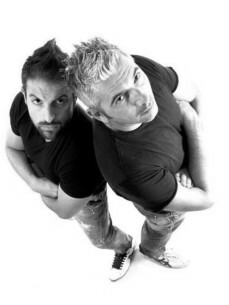 Their first single , Dirty Dirty immediately rose to the top of the Beatport house chart and has been appreciated, supported and played by many international DJs in many italian and also european club house 2013 consolidates their activities of producers and at the same time their presence in the top 10 of beatport house chart with the singles Rock the Beat, Do The Cha Cha, Mr. Brown In 2014, continuing their professional growth: the single What da F ** k, made by collabo with their friends Lookback, reaches the second place in beatport house chart , where it remained for over 2 months. At the beginning of summerhas been released the Absolut Groovers’ remix of one of the biggest dance hits of the past: Elegibò from Relight Orchestra. The remix, characteryzed by "house" and "club" sounds, is now supported and played by many international DJs. In October, Absolut Groovers are at ADE 2014, Amsterdam, where they play in two different party. In the month of october, is released their remix of Groove Phenomenon - Africa Tribe on the label Works ( Spinnin' ) This remix immediately reach tops positions on beatport top 100 house chart and it will remain in chart over 5 months.